The Original 'Cow Talk' call can stop a wounded bull elk giving you that 2nd and 3rd chance to shoot again. View the 'Art of Elk Hunting' video and you will see just that. Bulls, cows and calves communicate with each other year around. This is their language. If you are hunting elk without the Original 'Cow Talk' call, you are handicapping yourself. The Original &apos;Cow Talk&apos; call can stop a wounded bull elk giving you that 2nd and 3rd chance to shoot again. View the &apos;Art of Elk Hunting&apos; video and you will see just that. Bulls, cows and calves communicate with each other year around. This is their language. If you are hunting elk without the Original &apos;Cow Talk&apos; call, you are handicapping yourself. This is a year around call for calling in bulls as wells as cows. One end of the call can be tuned for calf sounds and the other for adult elk. 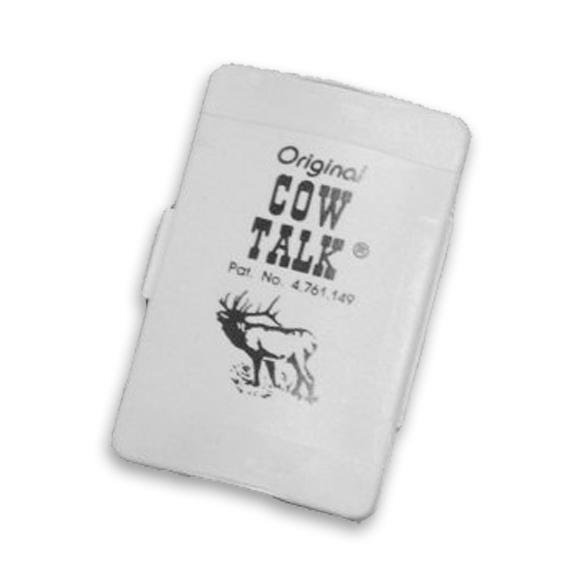 The &apos;Cow Talk&apos; call fits in your pocket and is not necessary to use with a grunt tube. This is not a diaphragm call and is easy to adjust. This is a small price to ay for a successful elk hunt. Don&apos;t leave home without it. This is the Original &apos;Cow Talk&apos; call and is patented and manufactured in Montana.